Lehman Catholic’s Brendan O’Leary runs the 110 meter hurdles during the Minster Invitational on Saturday in Minster. O’Leary finished first in the 300 hurdles in 44.23. Minster's Dana Prenger competes int the shot put during the Minster Invitational on Saturday in Minster. 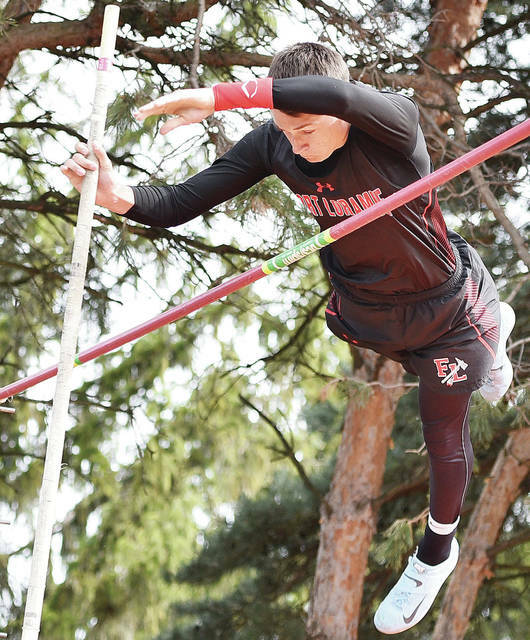 Fort Loramie’s Gavin Kemper competes in the pole vault during the Minster Invitational on Saturday in Minster. Kemper finished second in pole vault by clearing 12-0. 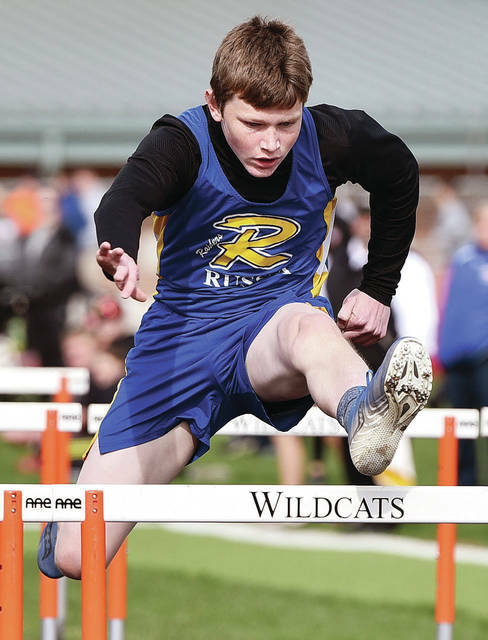 Russia's Jason Siefring competes in the 110 meter hurdles during the Minster Invitational on Saturday in Minster. Houston's Morgan Davis runs the 100 meter dash during the Minster Invitational on Saturday in Minster. 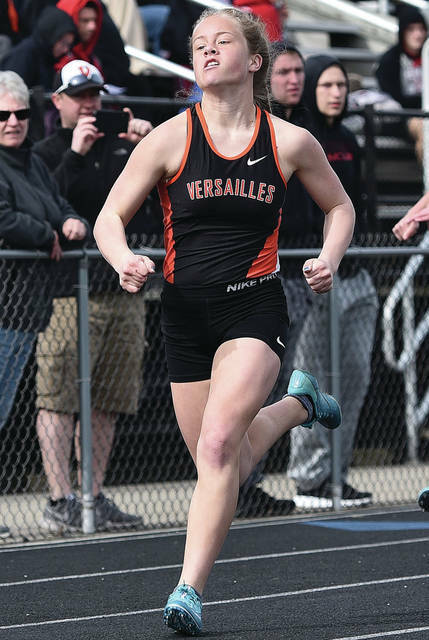 Versailles' Kelsey Francis runs the 100 meter dash during the Minster Invitational on Saturday in Minster. New Bremen's Riley Trentman crosses the finish line in the 110 meter dash during the Minster Invitational on Saturday in Minster. Lehman Catholic’s Mitchell Sollmann races to beat a throw to first base as Jackson Center’s Aidan Reichert waits during a nonconference game on Saturday in Sidney. Lehman Catholic's Jared Magoteaux attempts to tag Jackson Center's Christopher Elchert as Elchert safely arrives at third during a nonconference game on Saturday in Sidney. Minster’s Ella Boate, right, hands off to Gwen Meiring during the 4x800 meter relay during the Minster Invitational on Saturday in Minster. The Wildcats finished first in the event in 9:54. 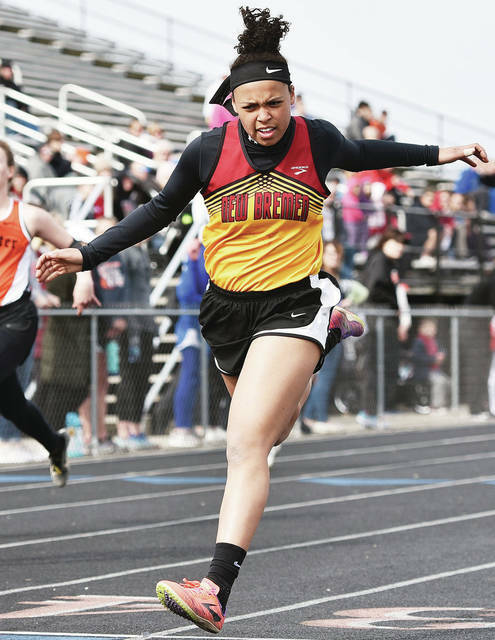 MINSTER — Fort Loramie and Minster’s boys and girls track teams each finished No. 1 or 2 out of 15 schools in the Minster Invitational on Saturday. Fort Loramie’s boys squad finished first with 130 points while Minster was second with 118. Russia finished fourth, Houston finished fifth, Versailles finished ninth, Lehman Catholic finished 11th and New Bremen finished 15th. Fort Loramie’s Jake Rethman was first in the 1,600 run in 4:36 while Joe Ballas was second in 4:38. Ballas was first in the 800 run in 2:04 and Rethman was first in the 3,200 in 10:34. Carson Moore was second in the 100 dash in 11.7 and Colten Gasson was third in the 3,200 in 10:52. Collin Detrick was first in shot put with a throw of 50-2 while Conner Raterman was second with a throw of 45-6.5. Detrick was second in discus with a throw of 142-7. Charles Wray was first in pole vault by clearing 12-3 while Gavin Kemper was second by clearing 12-0. The Redskins won the 3,200 relay in 8:24. Minster’s Broc Miller was first in the 100 dash in 11.5 and first in the 200 dash in 23.71 while Devon Schultz was first in the 400 dash in 53.22 and third in the 200 in 24.3. Alex Albers was third in the 1,600 run in 4:39 and third in the 800 run in 2:06. Carson Prenger was third in long jump with a leap of 18-11. The Wildcats won the 800 relay in 1:34 and the 1,600 relay in 3:39. They were second in the 400 relay in 46.74 and third in the 3,200 relay in 8:38. Russia’s Jason Siefring was second in the 110 hurdles in 16.23 while Mason Dapore was second in 23.90. Lee Magoto was third in the 400 dash in 53.5. Max Bohman was third in pole vault by clearing 11-6. The Raiders were second in the 1,600 relay in 3:40 and third in the 800 in 1:38. Houston’s Ethan Knouff was second in the 800 run in 2:04 and Tristin Freistuhler was second in the 3,200 in 10:45. Wesley Jester tied for second in high jump with 5-8. The Wildcats were second in the 3,200 relay in 8:26. Versailles’ Jack Osborne was second in long jump with a leap of 19-1. Lehman Catholic’s Brendan O’Leary was first in 300 hurdles in 44.23. Minster’s girls squad finished first with 108.5 points while Fort Loramie was second with 101. Versailles finished third, Lehman Catholic finished fourth, Houston finished ninth, Russia finished 10th and New Bremen finished 11th. Minster’s Kaitlynn Albers was first in the 1,600 run in 5:27 while Minster’s Mason Pohl was third in 5:32. Jenna Heuker was first in the 300 hurdles in 48.77. Madeline Magoto was first in the 800 run in 2:23. Gwen Meiring was first in the 3,200 run in 11:51 while Mackenzie Bohman was second in the 3,200 in 12:11. Ella Mescher tied for third in high jump by clearing 4-10. The Wildcats won the 3,200 relay in 9:54 and the 1,600 relay in 4:15. Fort Loramie’s Kennedi Gephart was first in the 200 dash in 26.19. Alyssa Wrasman was second in the 100 hurdles in 16.59 while Jenna Fischkelta was third in 16.81. Abby Wrasman was first in the high jump by clearing 4-10. Claire Rethman was second in the 1,600 run in 5:31. Anna Detrick was third in the 800 run in 2.28.75. The Redskins won the 800 relay in 1:49, were second in the 3,200 relay in 10:23, were second in the 1,600 relay in 4:22 and were third in the 400 relay in 54.21. Versailles’ Lucy Prakel was first in pole vault by clearing 11-0. Ava Moran was second in the 100 dash in 12.89 and second in the 200 dash in 26.45. Kate Griesdorn was third in long jump with 15-4. The Tigers were third in the 1,600 relay in 4:26. Houston’s Shelby Ayers was first in discus with a throw of 120-1 and first in shot put with a throw of 35-0.5. Mackenzie Wenrick was third in shot put with throw of 34-4.75. Russia’s Ella Hoehne was second in the 800 run in 2:28.41. Lehman Catholic’s Lindsey Magoteaux won the 100 in 12.86 and long jump with a leap 15-10.5. Rylie McIver was second in the 300 hurdles in 50.67 while Ella Monnin was third in 51.40. McIver was fourth in the 200 dash 27.83. The Cavaliers won the 400 relay in 52.19 and were second in the 800 relay in 1:50. Sidney’s boys squad finished third out of 13 schools at the Vandalia-Butler Invitational on Saturday while the girls were fifth. The boys had 91 points. Wayne edged Butler for first place 120.5-120. Sidney won the 1,600 relay in 3:43. Josiah Hudgins was first in high jump by clearing 6-2 while Curtis Spangler was third by clearing 5-6. Hudgins was second in long jump with a leap of 19-10.5. Gavin Bockrath was second in the 800 run in 2:04.98. Braden Guinther was third in pole vault by clearing 12-6. The Yellow Jackets finished second in the 400 relay in 46.24. Sidney’s girls squad had 58 points. Butler finished first with 160. Emma Wiford was first in discus with a throw of 95-4 and first in shot put with a throw of 34-9. Zoe Overholser was third in the 100 hurdles in 18.14. Mariana Kellner was third in the 1,600 in 6:04. Jalyn Rickey was third in pole vault by clearing 7-0. The Cavaliers scored one run in the fifth and two in the sixth to break a 2-2 tie, then held off a late rally attempt by Jackson Center in the seventh to earn a nonconference win on Saturday in Sidney. Lehman had eight hits and three errors while Jackson Center had eight hits and two errors. Brandyn Sever had 2 RBIs for Lehman, while Drew Barhorst and RJ Bertini had one each. Bradly Haynes had a double. Seth Roe and Jacob Trent combined struck out 10 batters and walked two on the mound for Lehman. Trent earned the win after pitching the last four innings. Christopher Elchert was charged with the loss for Jackson Center. He pitched one inning and allowed two earned runs on two hits. Elchert was 2 for 2 at the plate while Trent Platfoot was 2 for 4. Jacob Francis hit a home run. The Jets won the first game of a home nonconference doubleheader on Saturday in five innings. They scored four runs in the fifth inning to close out the win. Fairlawn had 14 hits and one error while Ridgemont had two hits and three errors. Doug Wright pitched a complete game and had seven strikeouts. Drew Maddy, Ashton Piper and Wright were each 2 for 3. Maddy and Piper each had a double, and Piper hit a home run. Skyler Piper also hit a double. Ashton Piper led the squad with 3 RBIs while Jordan Lessing scored a team-high three runs and had two stolen bases. The Jets scored seven runs in the first inning and cruised from there to win the second game of a home nononconference doubleheader on Saturday. Gage Sharrock picked up the win on the mound. Fort Loramie opened the three-game Zac Richard Classic on Saturday with a victory over host Versailles. The Redskins had 11 hits and one error while Versailles had eight hits and three errors. They scored one run in each of the first three innings and in the fifth and sixth. They closed out the win with two runs in the seventh. Griffin Meyer picked up the win for Fort Loramie. He pitched 1 2/3 innings and gave up one hit and two walks. CJ Billing pitched the rest of the way and allowed one earned run on seven hits and two walks. Billing had five strikeouts. Billing was 2 for 3 at the plate with one double. Devin Wehrman had 2 RBIs and Darren Hoying scored two runs. Garrett Toops picked up the loss for Versailles. He allowed three earned runs on eight hits and one walk in 5 2/3 innings. He had one strikeout. Toops was 3 for 3 at the plate with 2 RBIs and one run. The Redskins beat Troy Christian in the second game of the Zac Richard Classic on Saturday in Versailles. They built a 9-1 lead and then fended off a Troy Christian rally in the seventh. Versailles closed out the Zac Richard Classic with a victory over Troy Christian on Saturday. The Eagles jumped out 3-0 in the top of the first inning. Versailles plated three runs in their half of the first with a Will Eversole two run single to center scoring Andrew Demange and Kyle Pothast. Brayden Robinson picked up the third RBI of the inning plating Zach Griesdorn on a groundout to third to knot the score at 3-3 after one inning of play. The Eagles added two runs in the top of the sixth while Versailles added a run in the bottom of the inning to take a 13-5 lead heading into the seventh. 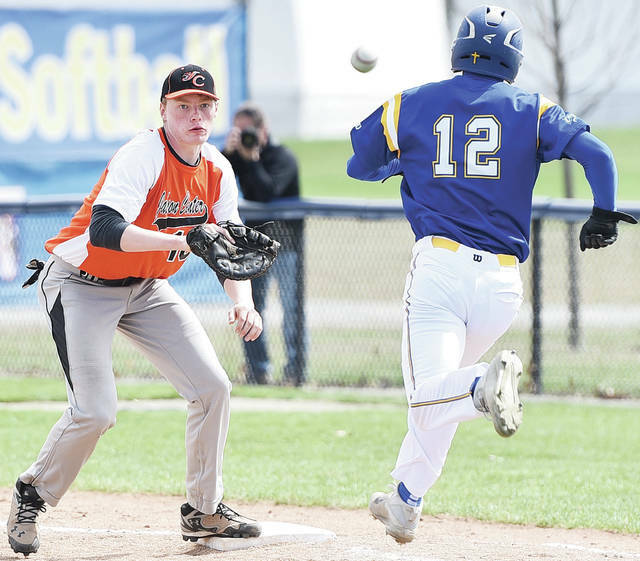 Eversole paced Versailles with four hits on the day with a single in the first, a double in the third and singles in the fourth and fifth innings. Griesdorn went 2 for 3 with 2 RBIs and three runs. Garrett Toops was 2 for 4 with 3 RBIs and a run and Nathan Wagner went 2 4 with 1 RBI and one run. Adam Kremer picked up the win in five innings of work on the mound allowing six hits and five runs while striking out four and walking two. The Wildcats scored eight runs in the fifth inning to earn a run-rule win in the first game of a doubleheader on Saturday in New Knoxville. They had 15 hits and two errors while New Knoxville had two hits and five errors. Brennan Arnold pitched a complete game for Houston. He had seven strikeouts. Arnold and Dominic Beaver were each 3 for 4 at the plate. Arnold had 3 RBIs and three runs while Beaver had 2 RBIs and two runs. John Leist and Jake Leist were both 2 for 4. Jake Leist had 3 RBIs and John Leist scored three runs and batted in two runs. John Leist and Howie Ludwig each had a double. After a slow start, Houston scored seven of its eight runs in the last four innings to run away in the second game of a doubleheader on Saturday in New Knoxville. Houston had 11 hits and two errors while New Knoxville had three hits and three errors. Noah Baltes pitched a complete game for the Wildcats. He had seven strikeouts. John Leist and Devin Barker were both 2 for 4 at the plate. The Trojans scored seven runs in the third inning to take control, and the Raiders couldn’t mount a comeback in a nonconference game on Saturday in Russia. Arcanum had seven hits and no errors while Russia had nine hits and three errors. Aiden Shappie was charged with the loss of Russia. He gave up four earned runs on three hits and three walks in 2 1/3 innings. Evan Monnier and Carter Francis each had two hits for Russia. The Raiders scored 10 runs in the second and 12 in the fourth to break open the second game of a tripleheader on Saturday in De Graff. Ben Logan had 24 hits and one error while Riverside had one hit and nine errors. Levi Godwin was charged with the loss for Riverside. He pitched three innings and allowed 10 earned runs on 13 hits and four walks. He had five strikeouts. Brody Rhoads picked up Riverside’s hit. The Pirates lost the last game of a home tripleheader on Saturday in five innings. St. Marys had 11 hits and three errors while Riverside had six hits and five errors. Harley Asbury was charged with the loss. He pitched a complete game and gave up five earned runs on 11 hits. He had three strikeouts. Asbury was 2 for 2 at the plate. The Trojans lost 13-7 and 9-4 in a doubleheader against Lima Perry on Saturday in Botkins. Lehman Catholic was sixth out of eight schools at the Schroeder Invitational on Saturday at Schroeder Tennis Center in Tipp City. Danny Lins placed fourth at first singles, defeating Celina’s Cubberly 8-1, falling to Kenton Ridge’s Kellen Kronour 8-5 and falling to Northwestern’s Reilly Smith 8-0. The second doubles team of Sean Toner and Cole Kramer also placed fourth, defeating Kenton Ridge’s Ben Yirak and Brecken Leffel 8-2 before falling to Tippecanoe’s Jack Thompson and Luke Blake and falling to Milton-Union’s Caleb Wintrow and Will Morris. Sam Gilardi was fifth at second singles, falling to Tippecanoe’s Christopher Nichols, defeating Piqua by default and defeating Kenton Ridge’s Arnie Scarberry 8-1. Elijah Jock was fifth at third singles, falling to St. Marys’ Mason King 8-3, defeating Northwestern’s Brady Huber 9-7 and defeating Celina’s Justin Bruggerman 8-0. At first doubles, Elias Bezy and Max Schmiesing placed seventh, losing to Tippecanoe’s David Shininger and Levi Berning, losing to St. Marys’ David Keller and Evan Tennant 8-5 and defeating Piqua’s Cael Barr and Jackson Elliott 8-2. 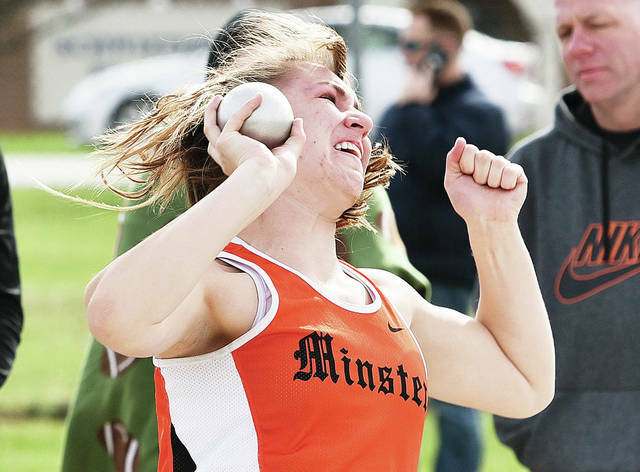 Minster’s Dana Prenger competes int the shot put during the Minster Invitational on Saturday in Minster. 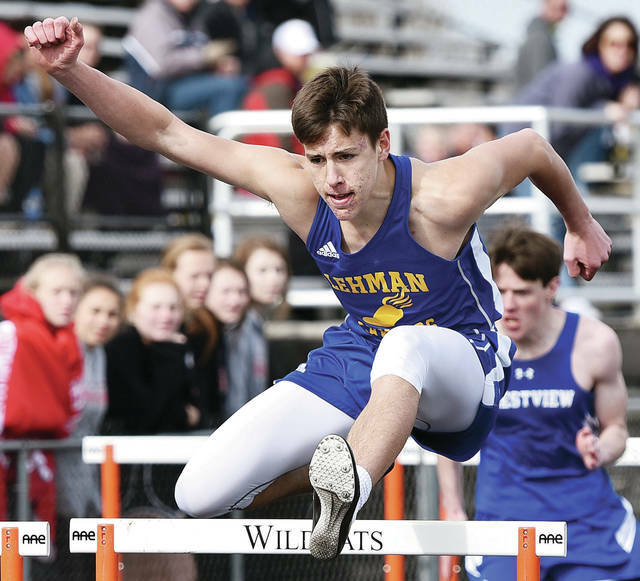 Russia’s Jason Siefring competes in the 110 meter hurdles during the Minster Invitational on Saturday in Minster. 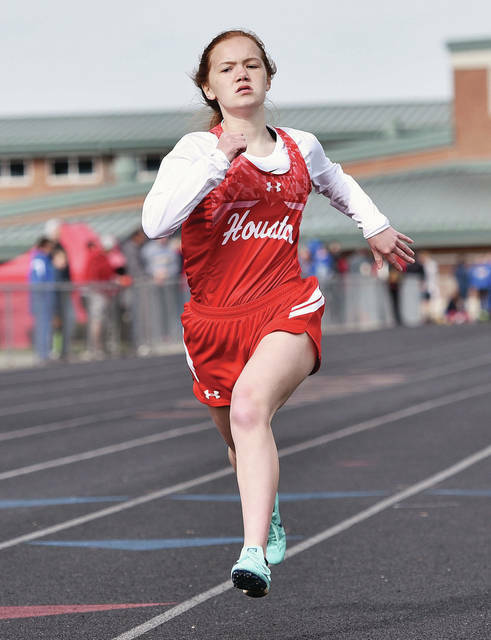 Houston’s Morgan Davis runs the 100 meter dash during the Minster Invitational on Saturday in Minster. Versailles’ Kelsey Francis runs the 100 meter dash during the Minster Invitational on Saturday in Minster. New Bremen’s Riley Trentman crosses the finish line in the 110 meter dash during the Minster Invitational on Saturday in Minster. 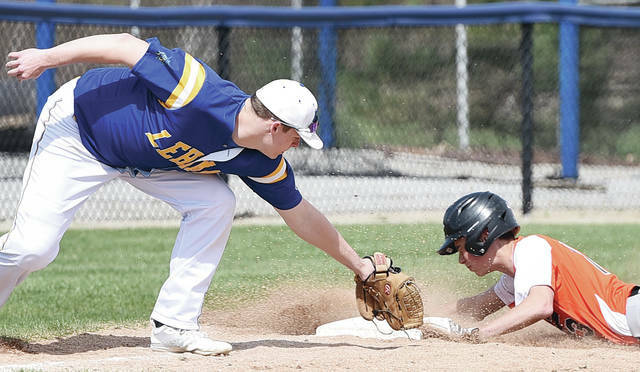 Lehman Catholic’s Jared Magoteaux attempts to tag Jackson Center’s Christopher Elchert as Elchert safely arrives at third during a nonconference game on Saturday in Sidney. 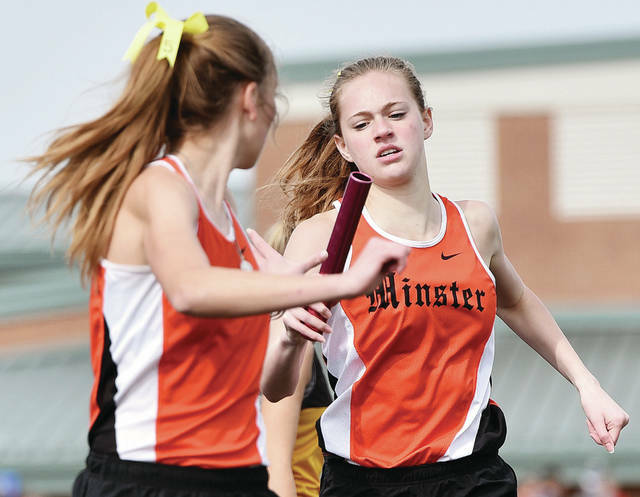 Minster’s Ella Boate, right, hands off to Gwen Meiring during the 4×800 meter relay during the Minster Invitational on Saturday in Minster. The Wildcats finished first in the event in 9:54.